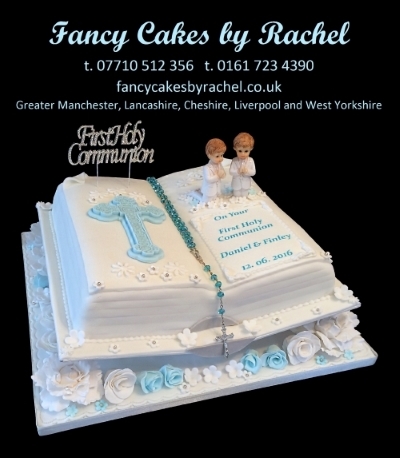 Celebrate your child's First Holy Communion with a bespoke cake from Fancy Cakes by Rachel. We make Bible cakes, Cross cakes, Carousel cakes and cakes with blocks, teddy bears, rattles and bootees or we can put a sugar model of your child's favourite soft toy on the cake. All of our cakes are baked fresh to order using the best quality ingredients. You can choose from a range of different flavours, please look at the cake flavours page. The most popular flavours for Holy Communion cakes are the vanilla madeira cake with jam and buttercream filling and the chocolate cake, made with the finest quality Belgian chocolate.